LONDON, May 15 (AFP) – Carlo Ancelotti believes Chelsea can follow their historic double by finally ending the club's long wait to win the Champions League. Ancelotti's side beat Portsmouth 1-0 in Saturday's FA Cup final at Wembley to become only the seventh English club to win the league and cup in the same campaign. It was the perfect end to a memorable first season at Stamford Bridge for Ancelotti, but the Italian knows Blues owner Roman Abramovich will never be truely satisfied until Chelsea are crowned kings of Europe. Abramovich hired former AC Milan coach Ancelotti primarily because of his impressive track-record in Europe's elite club competition. But Russian had to suffer the indignity of watching ex-Chelsea boss Jose Mourinho, sacked by Abramovich after a bitter power struggle, knock out his old club with Inter Milan this season. That last 16 defeat still rankles with everyone at Chelsea, who have reached at least the semi-finals of the competition five times in the last seven years, and Ancelotti is happy to make Champions League success his number one priority. "The Champions League is an important competition. 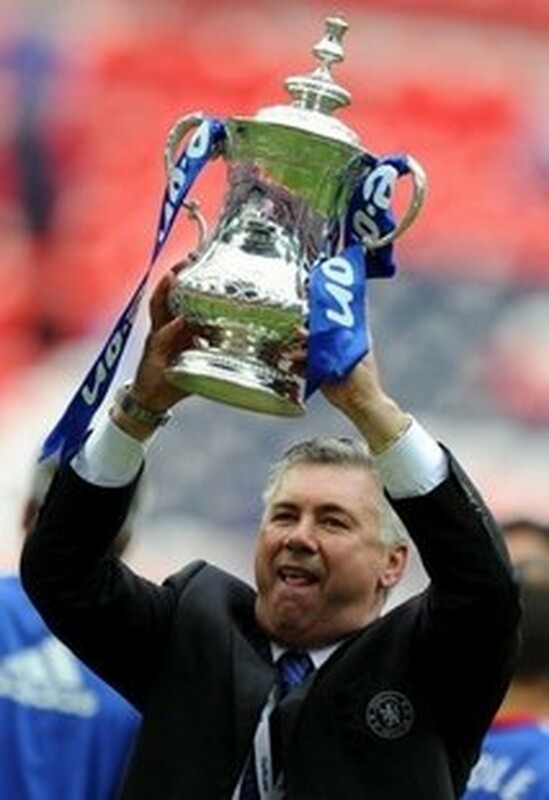 We know Chelsea never won it and it will be one of our aims for next season," Ancelotti said. "I will try to win the Champions League. We tried to win it this year but it didn't happen. "The Premier League and FA Cup are also important but this team has the quality to win the Champions League without any changes." After a season in which Chelsea hit a Premier League record 103 goals and produced the kind of entertaining football Abramovich has always demanded, most managers would expect to have a job for life. But Chelsea is a more political club than most - as a record of four managers in the last three years shows all too clearly - and Ancelotti knows he must continue to produce this kind of success to remain in a job. "Pressure is normal," he said. "We will start next season with the double and that will put more attention and pressure on us. We are proud to have this attention. "We want to win again next year but the most important thing is to do our best." For a while on Saturday it seemed Chelsea were destined to endure an unhappy end to their season. Frank Lampard and John Terry had already hit the woodwork by the time Salomon Kalou somehow contrived to fire against the crossbar with an empty goal just three yards in front of him. The Blues struck wood twice more after that and should have fallen behind when substitute Juliano Belletti's misjudged tackle on Aruna Dindane conceded a 55th minute penalty. Fortunately for Ancelotti, Kevin-Prince Boateng's spot-kick was too close to Petr Cech, who saved with his legs. Just four minutes after that narrow escape, Didier Drogba gave Chelsea the lead with a fine free-kick which flashed past David James for his seventh goal in six English domestic cup finals. Lampard dragged a penalty wide in the 88th minute after the England midfielder was tripped by Michael Brown, but Chelsea had done enough to deserve the win. Ancelotti believes the character of his players was key to their double success and he insisted he never doubted the aging squad were still hungry for success. "I always thought I had fantastic players here. This team has very good experience," he said. "Everyone gave their best. When we had difficult moments we were able to stay compact and move on quickly. "I could count on the support of the owner and the players and so it was not so difficult to manage."